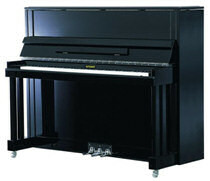 Wyman Piano Company introduces its new 46" Wyman Pianoforte Vertical Model WV118DL upright piano at the upcoming January 2008 NAMM Convention in Anaheim, CA. This stunning new instrument is finished in Classic Polished Ebony with tasteful Polished Chrome accents. The beautiful contemporary cabinet features a unique double leg design, a new silver plate finish, as well as polished chrome hardware, and an adjustable deluxe artist taboret bench. Quality features relating to musical performance, as well as durability, are consistent with features found in the Wyman Pianoforte grand models: for example, the premium Yumei™ hard rock maple action; premium Yumei™ spruce keys; 19-ply hard rock maple wrestplank; solid copper wound bass strings; treble strings crafted from Roslau™ music wire; Lifetime TriPhonic™ spruce soundboard; and a transferable 12-year parts and labor warranty. "Dealers previewing this beautiful new instrument are impressed with its smooth responsive action and its beautiful fit and finish," said Tim Laskey, Wyman Piano Company president. George Benson, Wyman's national sales manager said, "Dealers are equally impressed with the grand piano-like tone of the new Wyman Pianoforte WV118DL, and the quality of materials used to manufacture the instrument."